Go back to Thailand page. 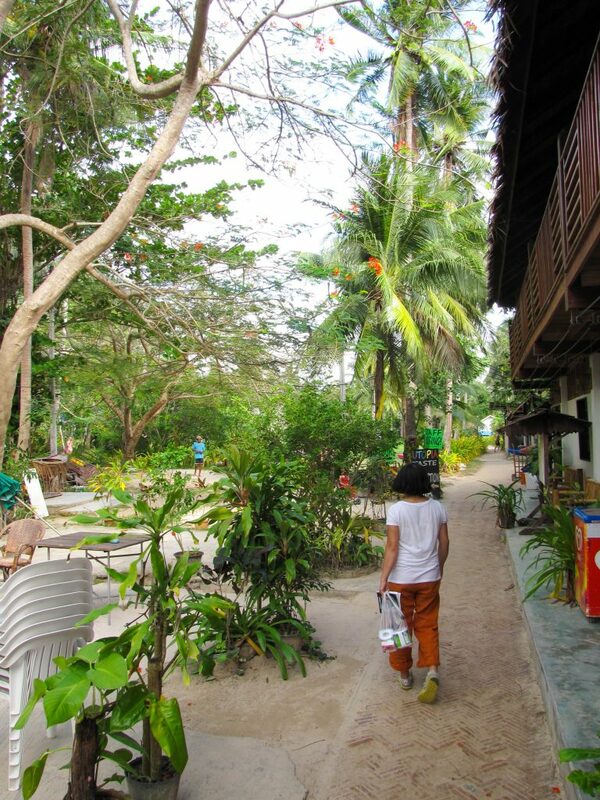 Go back to Krabi Part 1. Pai Noon Mai on Ton Sai Tower. 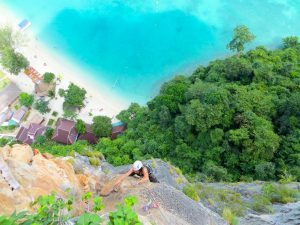 Over the next few days we climbed a few more lines including The Big Wave (5-pitch 6b…soft) in Tonsai and Pai Noon Mai (5 pitch 6b+…softer but very scenic) on Phi Phi Don Island, a 90-minute ferry ride away. Our limited schedule was further trimmed by one rainy and one very rainy day. 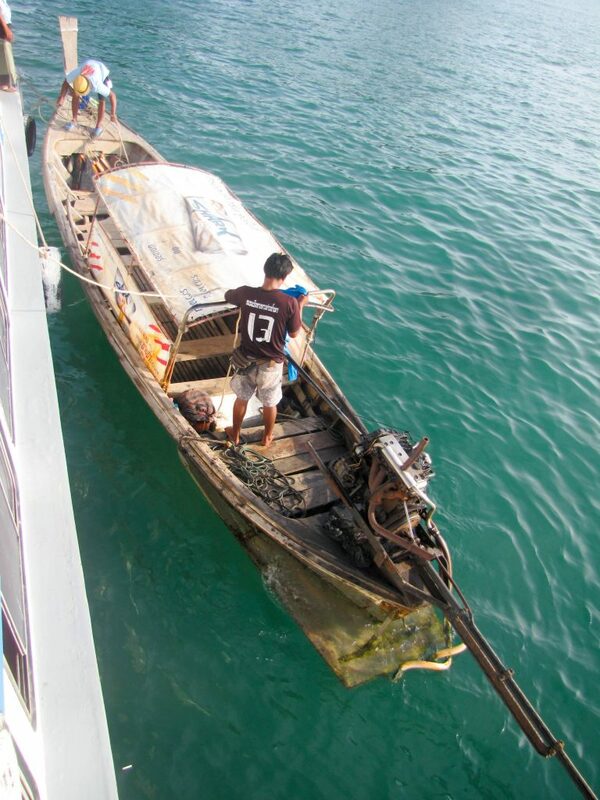 We made one boat trip to the Ao Nang Tower but the waves were too high that day and the boat man could not deposit us onto the rock. Our post-climb hours were spent eating, drinking, and spending time with Shirley’s Mom. 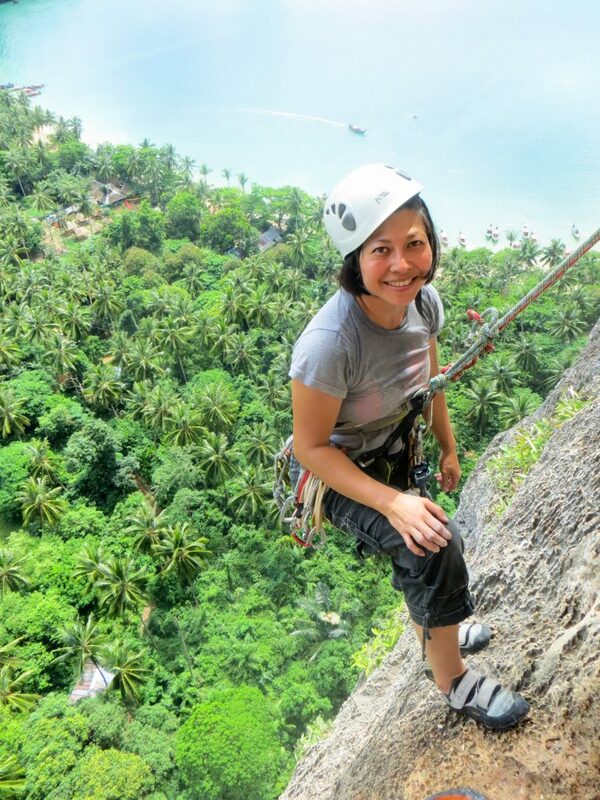 This is probably the first climbing trip where we’ve gained weight. 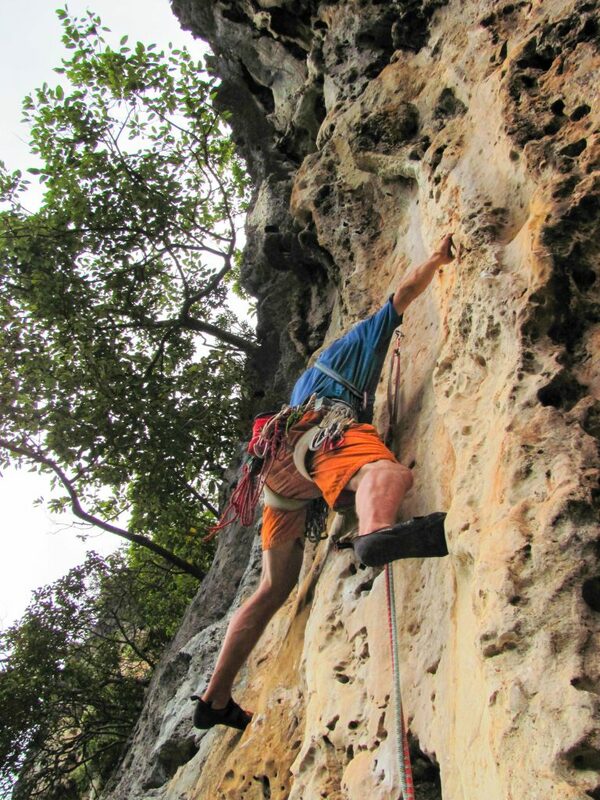 Starting up Big Wave route on Monkey World Wall (Jan. 2013). 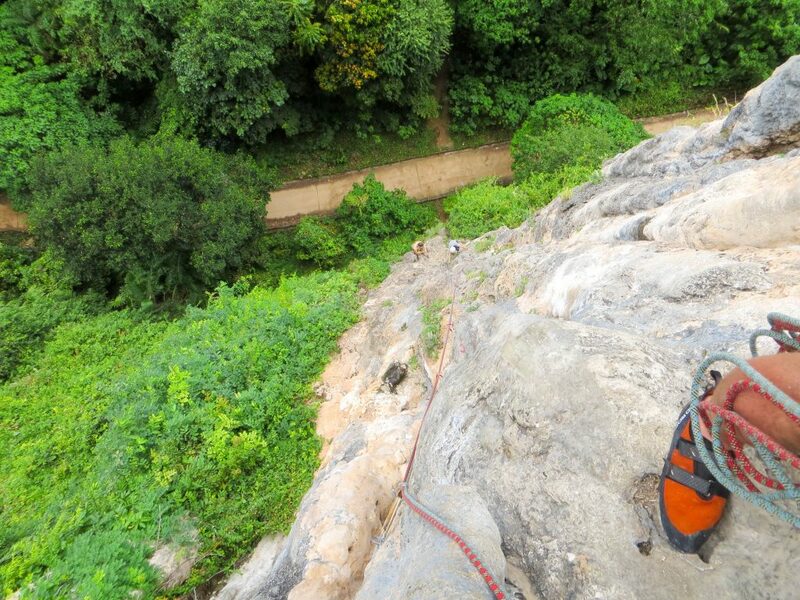 Shirley on pitch one of Big Wave route on the Monkey World Wall (Jan. 2013). 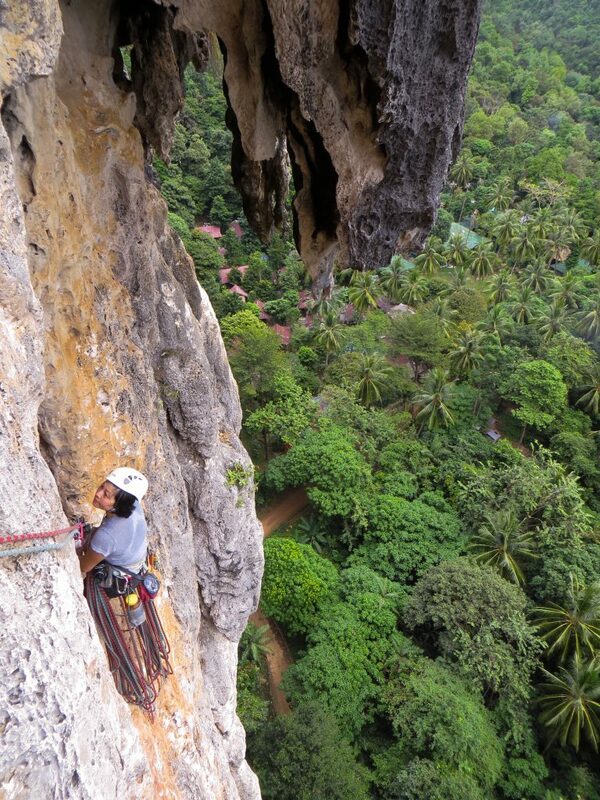 Leading pitch 2 (Jan. 2013). 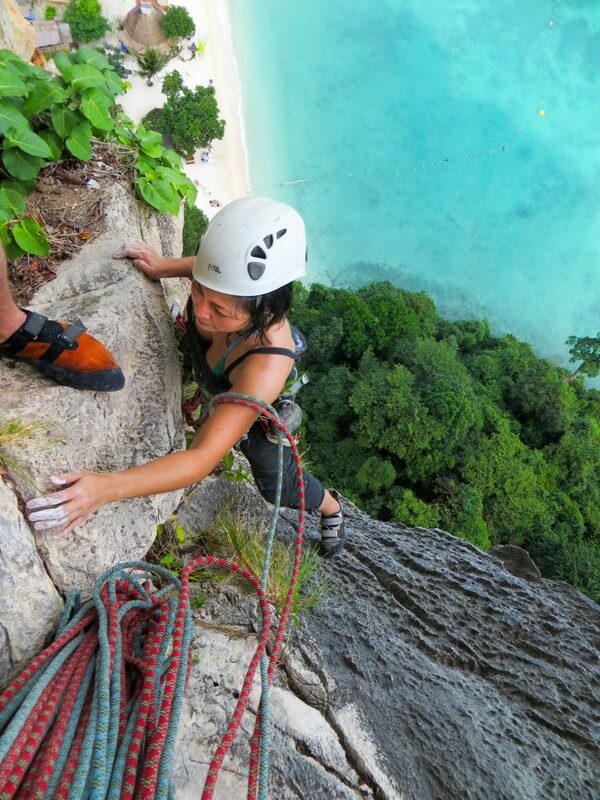 Shirley topping out on pitch 2 of Big Wave (Jan. 2013). Tonsai Beach from somewhere on the Big Wave route. A muggy, drizzly day in Jan. of 2013. Leading pitch 3 of Big Wave (Jan. 2013). Views inland form Big Wave (Jan. 2013). 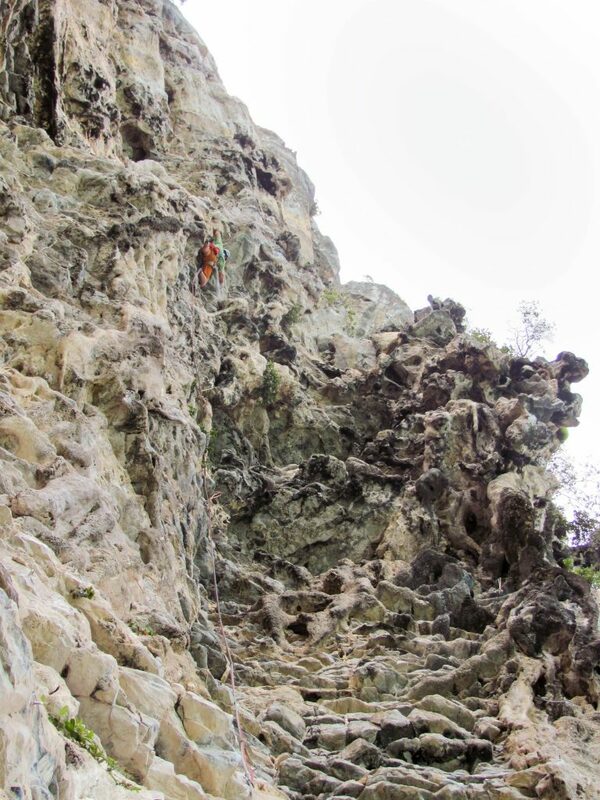 Shirley following pitch 3 of Big Wave – the climbing on this route gets funner with higher elevation (Jan. 2013). 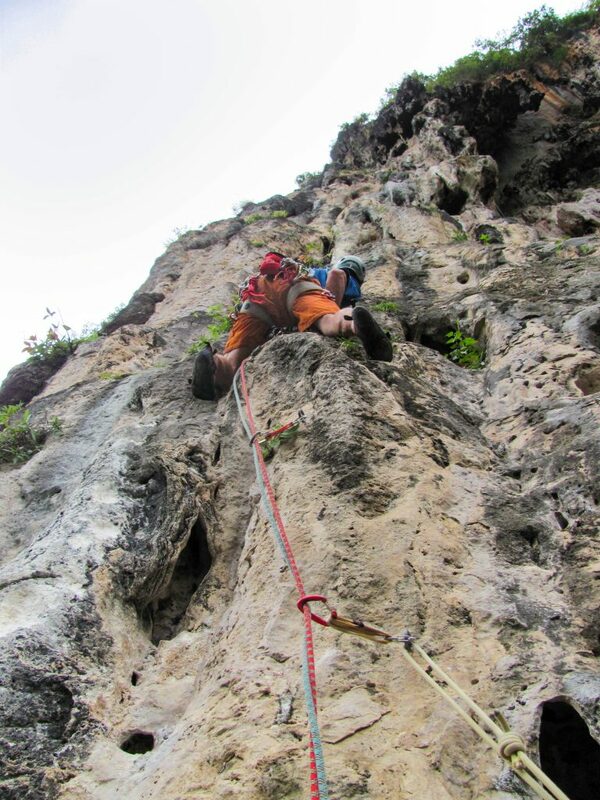 Leading the final pitch of Big Wave – a short and steep 6b jug-haul (Jan. 2013). 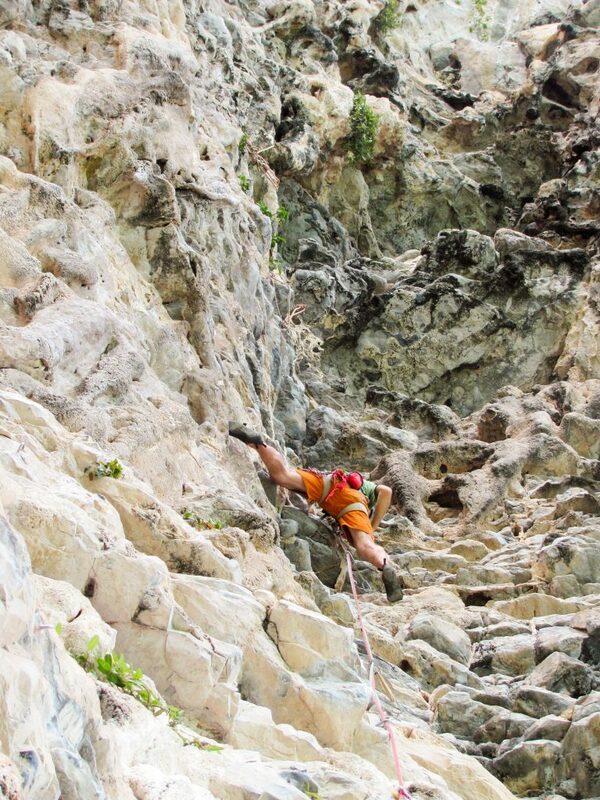 Shirley belaying me on the fourth pitch of the Big Wave route (Jan. 2013). 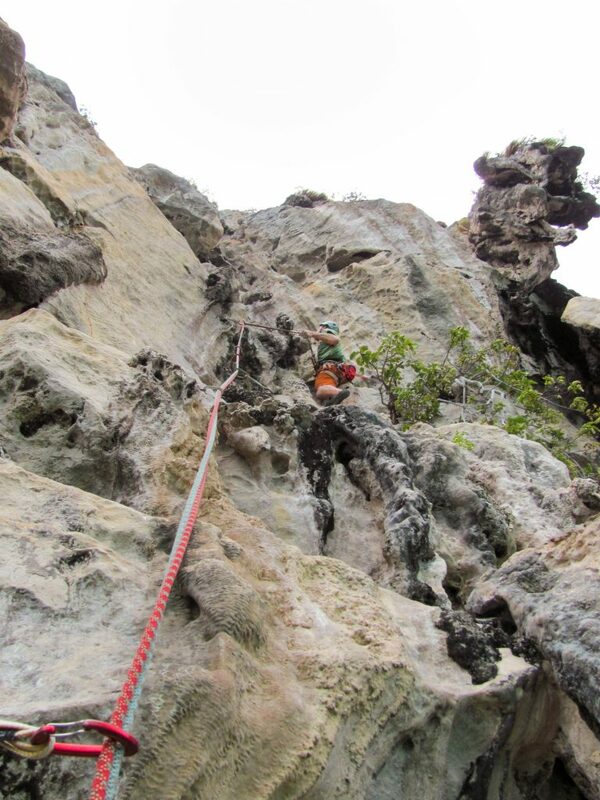 Shirley seconding the last pitch (Jan. 2013). Beginning the descent off Big Wave (Jan. 2013). 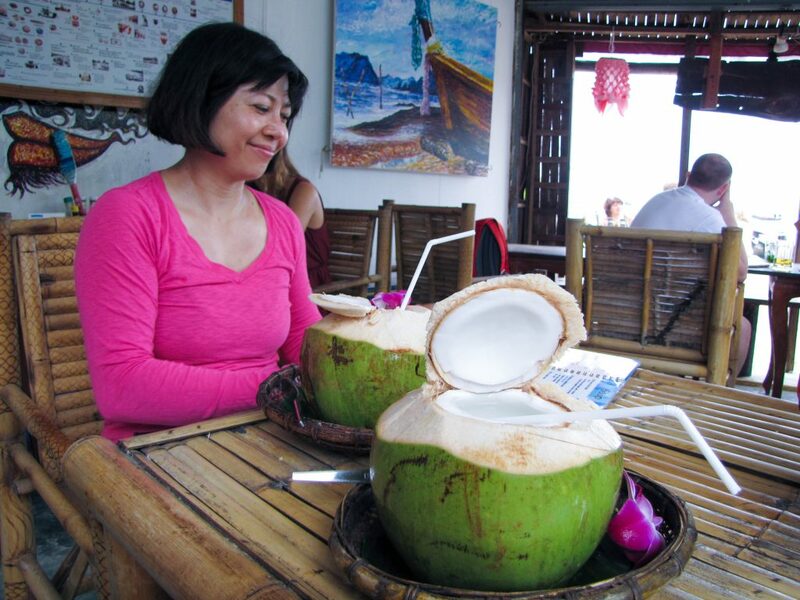 Fresh coconut juice…too hot and too many culinary distractions to really put in a lot of milage on the rock (Jan. 2013). Hiking Tonsai Beach with Fire and Shadow Walls in the background (Jan. 2013). 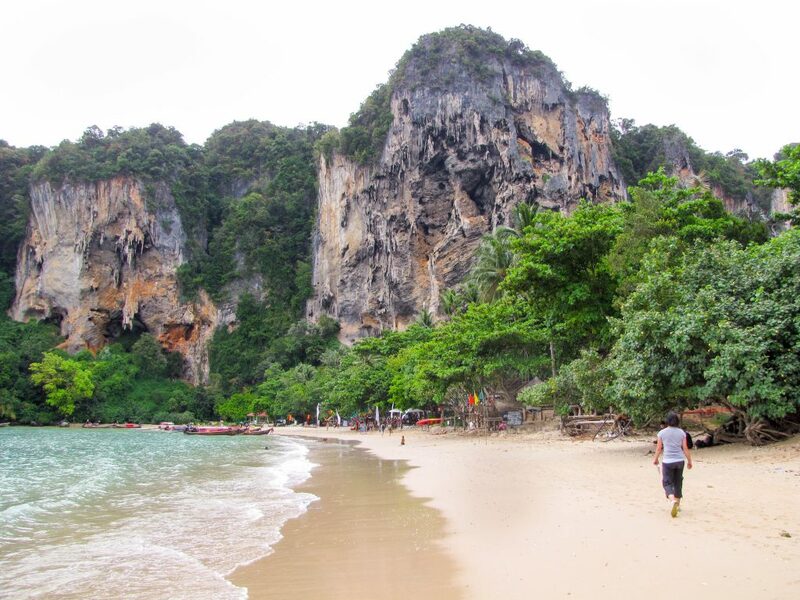 Probably one of our favorite trips in terms of culinary experience…this is Railay East. 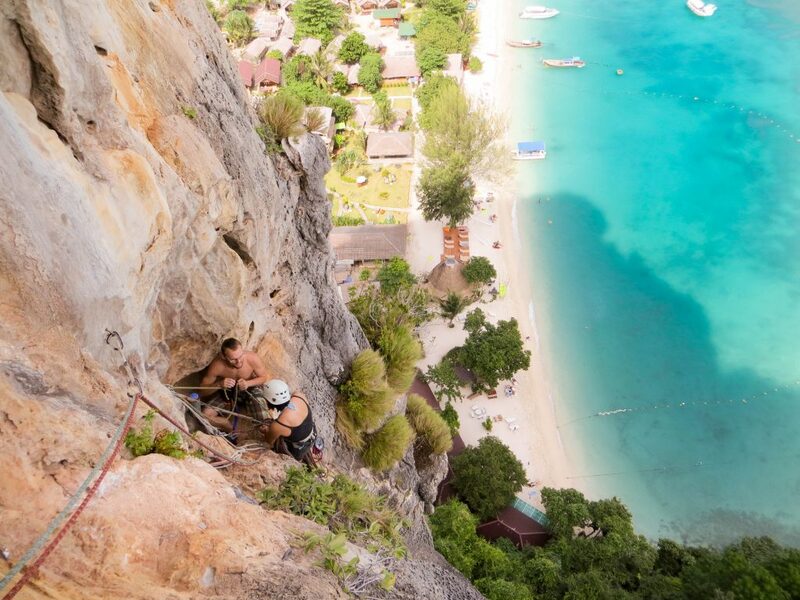 Theme of the trip was some 5.10 climbing with a whole shitload of 5.13 eating. First time we gained weight on a trip as well I think (Jan. 2013). 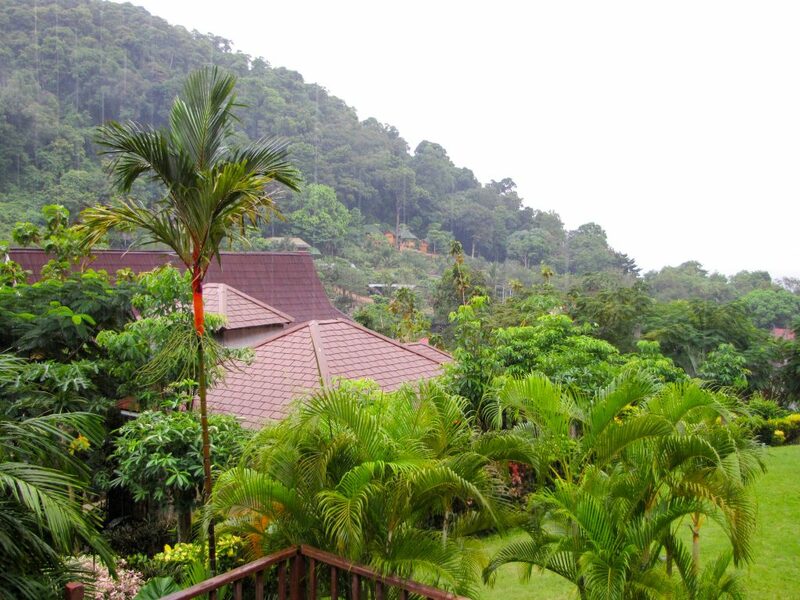 A rainy day as seen from the hotel patio (Jan. 2013). 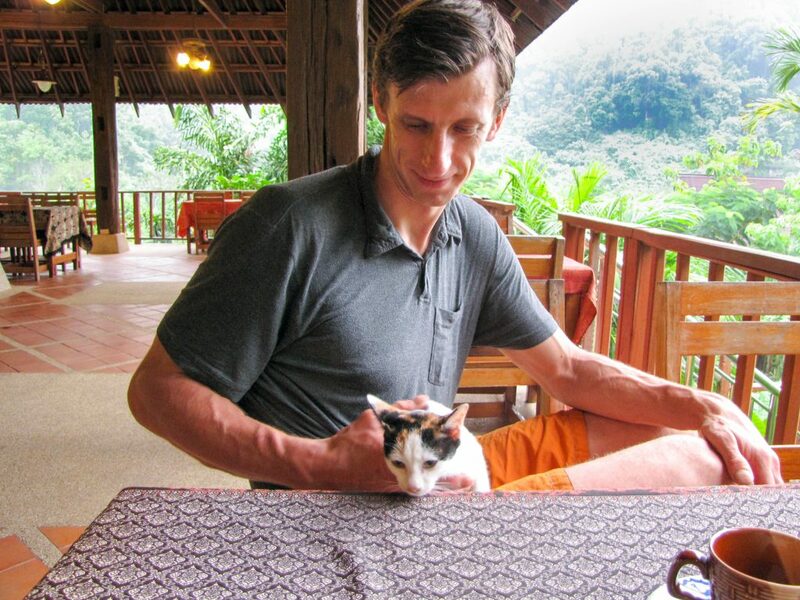 Rainy day activity in Railay…playing with the local cats (Jan. 2013). 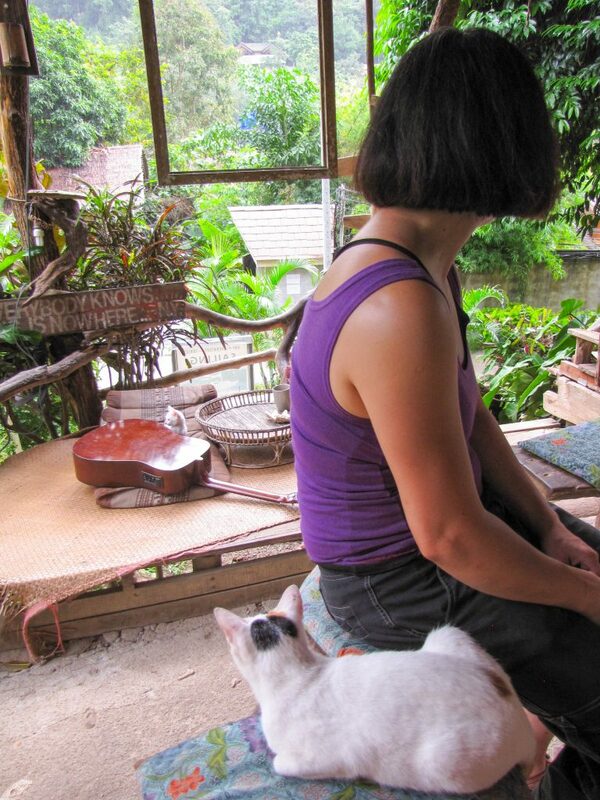 Killing time in a coffee shop on a rainy day in Railay. The ubiquitous local cats provide the entertainment (Jan. 2013). 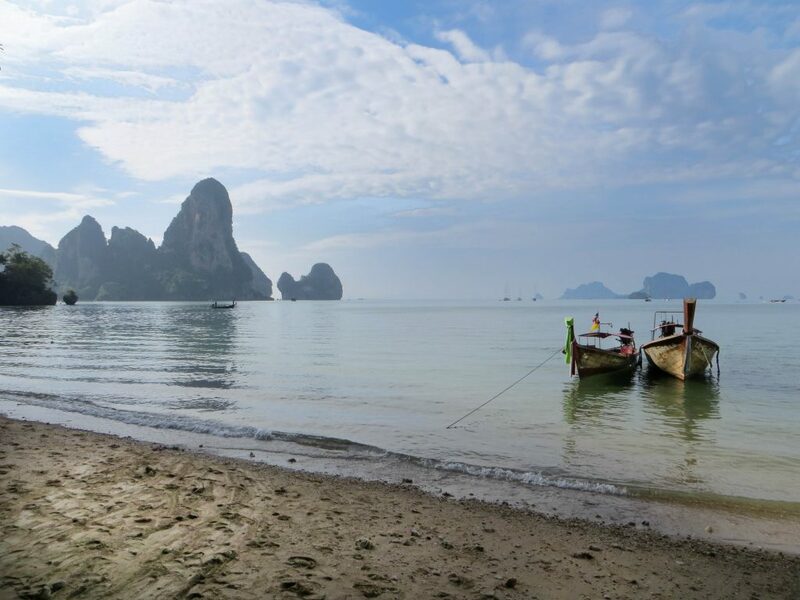 The Ao Nang Princess (ferry) making at stop off of Railay Beach on her way to the Phi Phi Don (island). 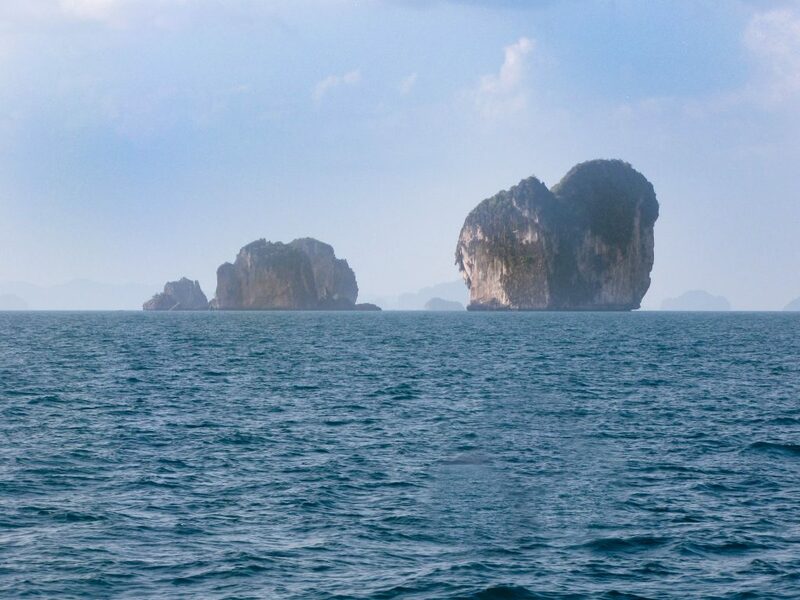 Cool looking rock islands in the Andaman Sea between Railay and Phi Phi Don (Jan. 2013). 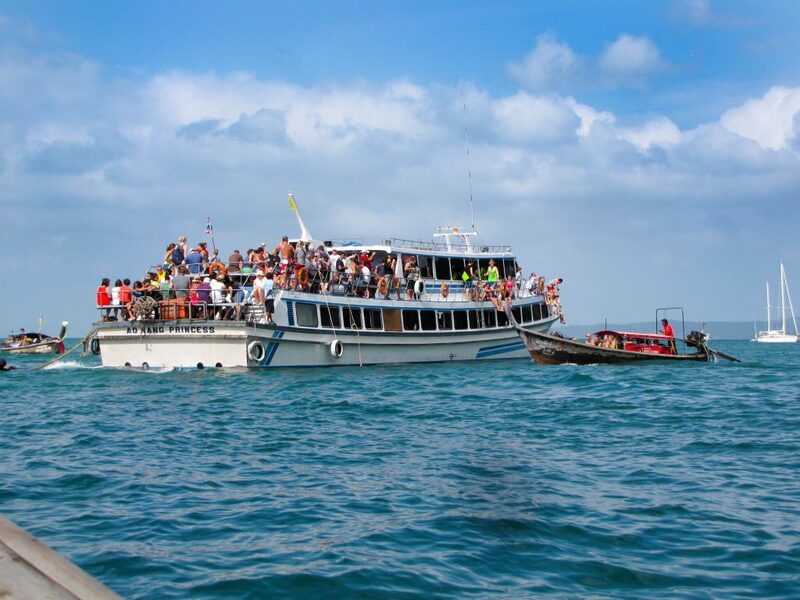 A slightly overloaded Ao Nang Princess ferry en route to Phi Phi Don island (Jan. 2013). 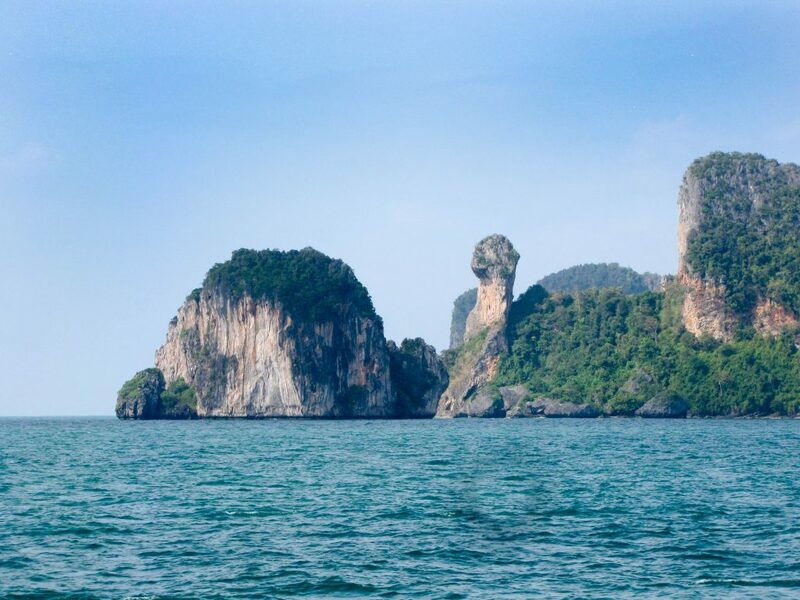 More funky looking islands (karsts) in the Andaman Sea (Jan. 2013). 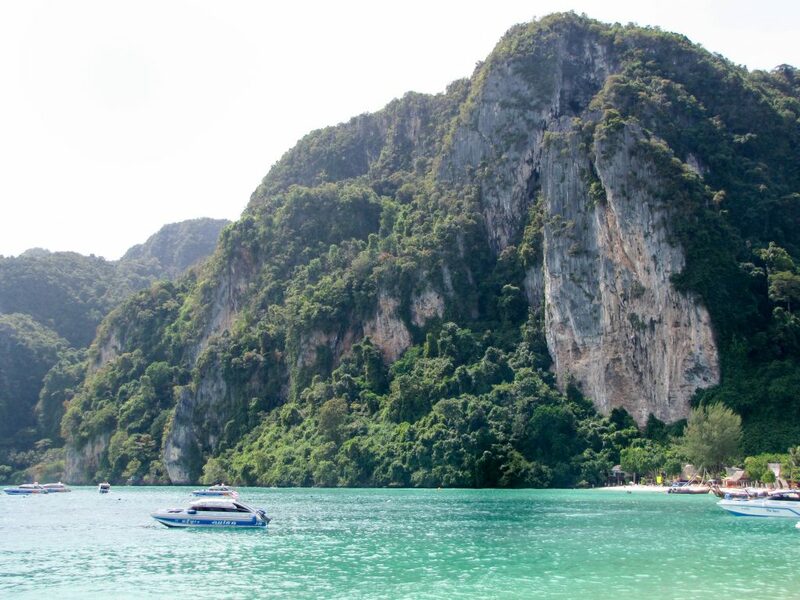 Arriving on Phi Phi Don Island (Jan. 2013). 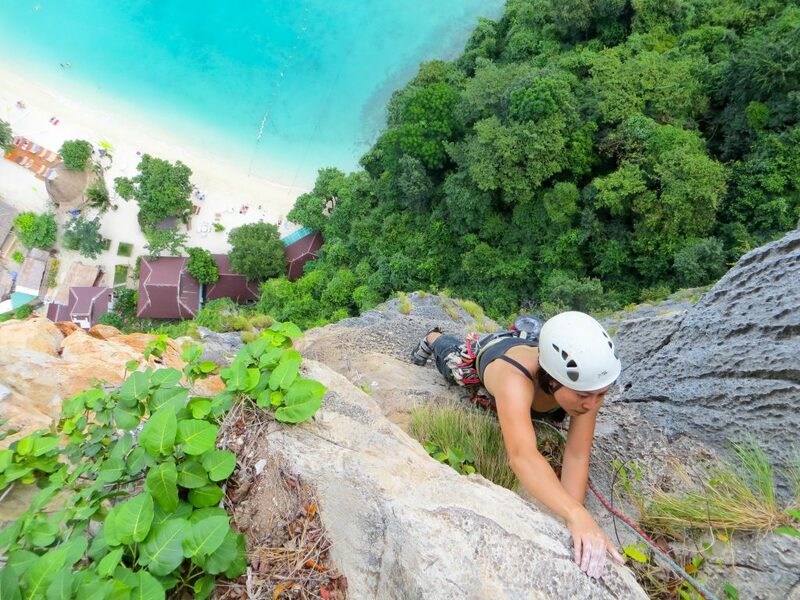 Tonsai Tower on Phi Phi Don island (Jan. 2013). 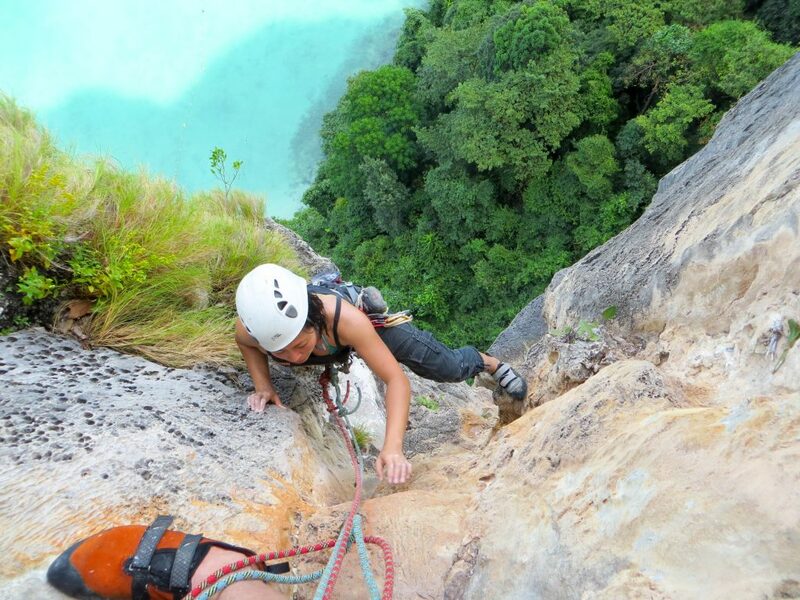 Leading the first two pitches of Pai Noon Mai route on the Ton Sai Tower on Phi Phi Don. 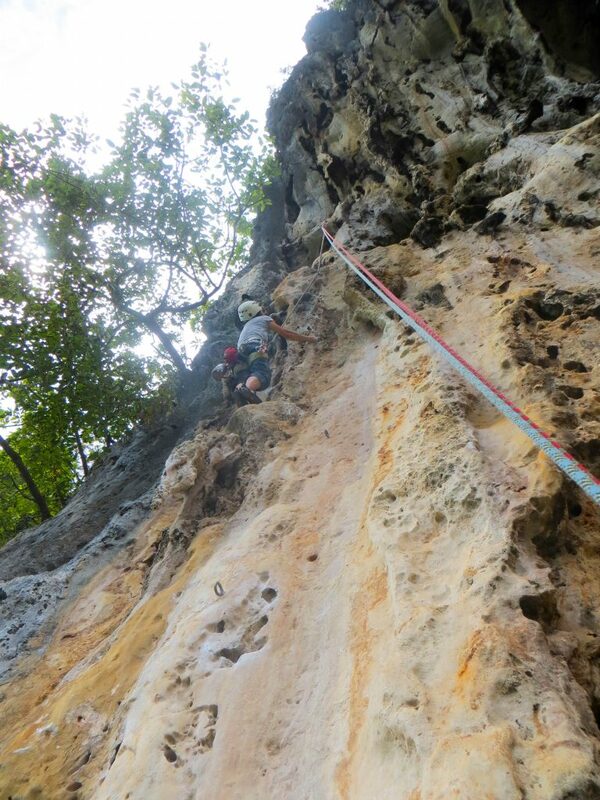 Easy (5) but very fun climbing. 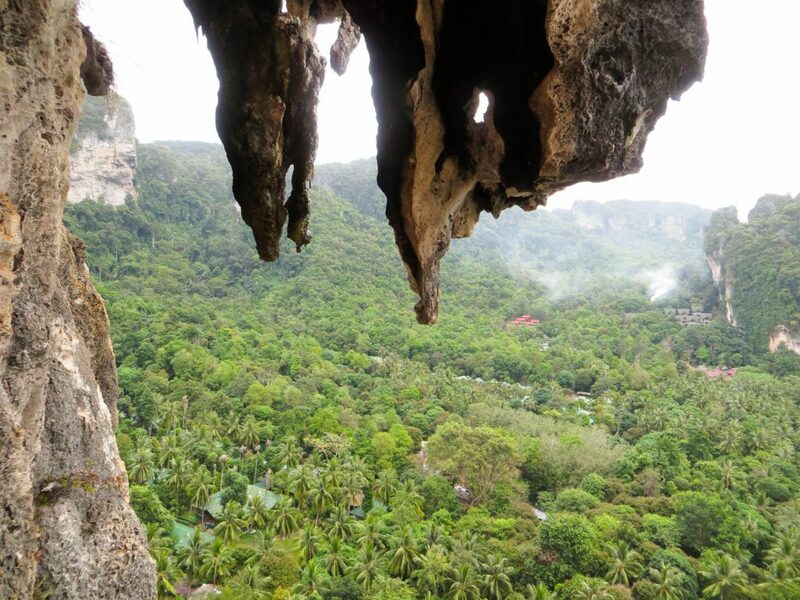 We were somehow reminded of the lower pitches of Wolf Rock’s Barad Dur (if easier; Jan. 2013). 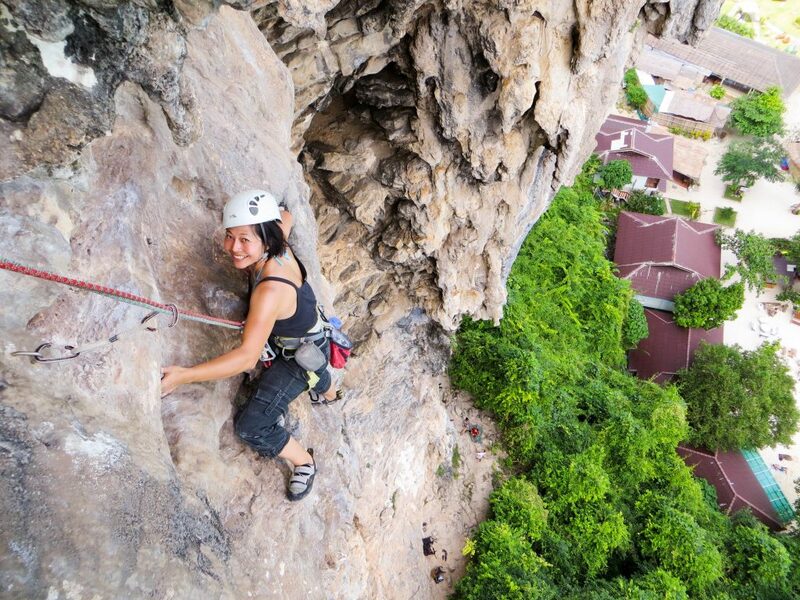 Shirley on pitches 1 and 2 of Pai Noon Mai (Jan. 2013). 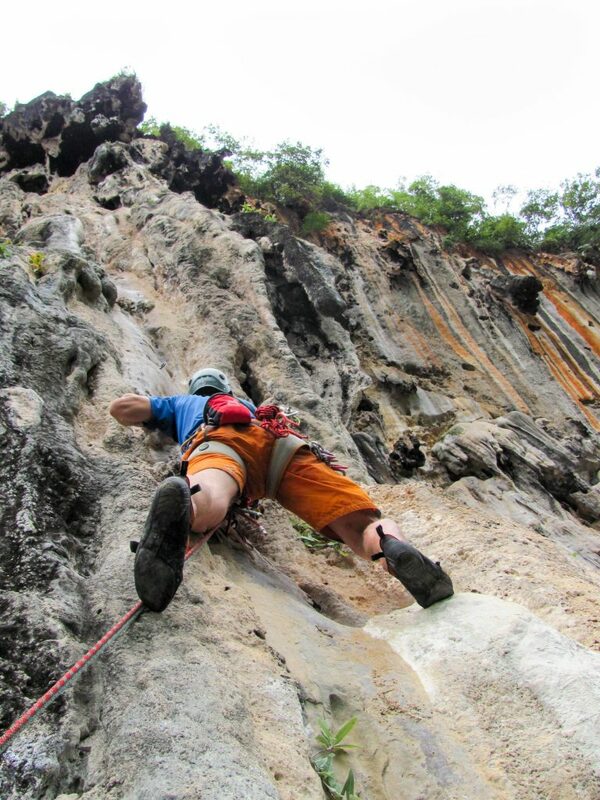 Leading pitch 3 (probably; Jan. 2013). 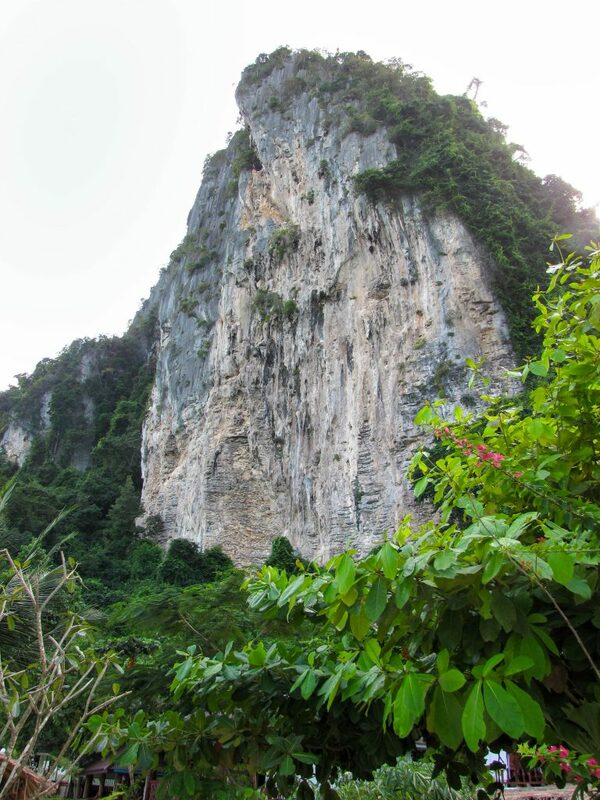 Shirley following the pretty third pitch (6b+) of Pai Noon Mai. 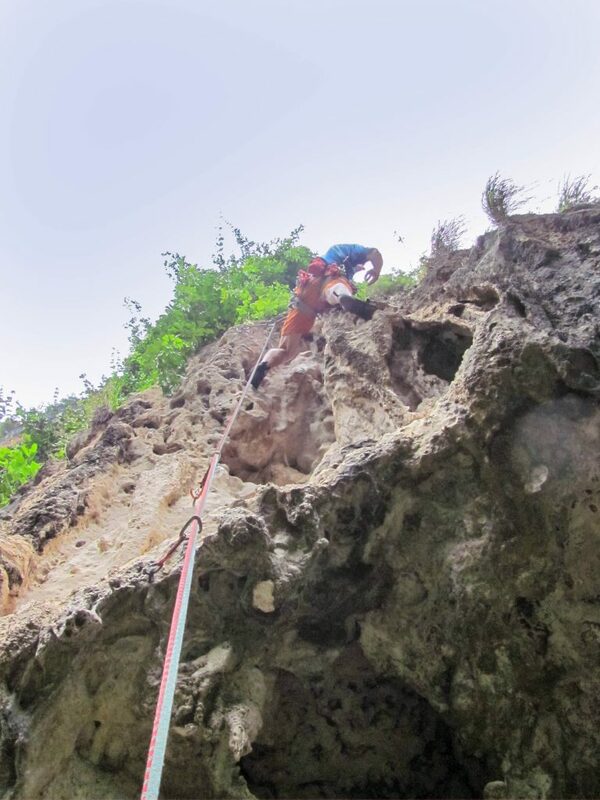 Some athletic moves were required for me at the start to overcome the overhanging terrain (lots of bolts and plenty of jugs however). There’s a Czech team waiting their turn at the belay (Jan. 2013). 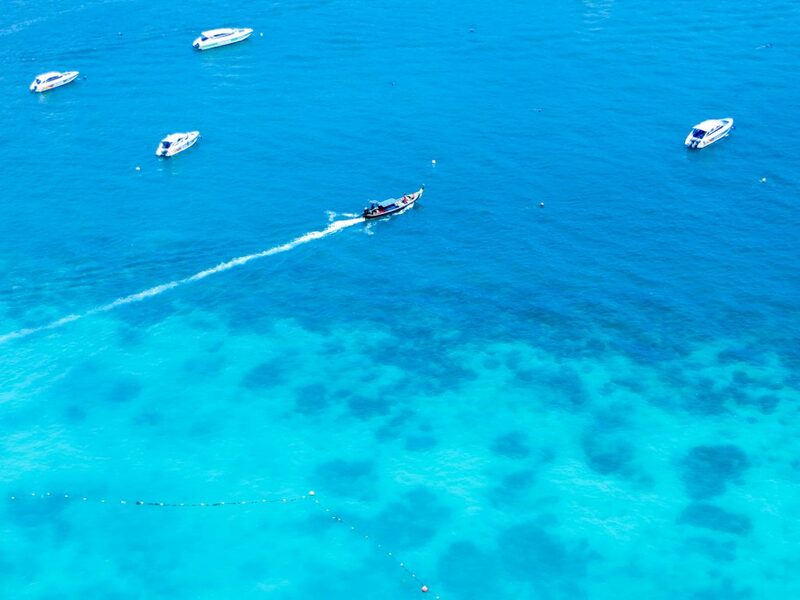 A long-tail boat gliding through the turquoise waters near Phi Phi Don (Jan. 2013). Topping out on pitch 3 (Jan. 2013). 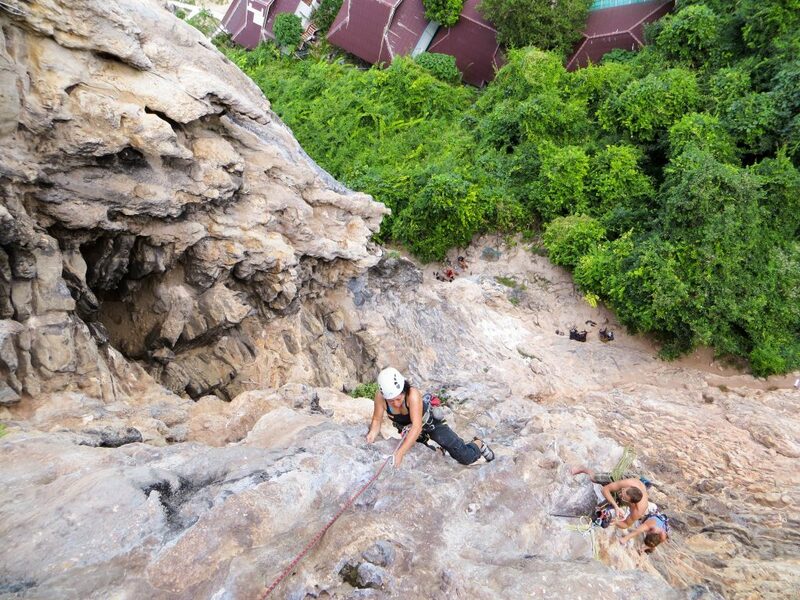 Leading pitch 4 of Pai Noon Mai (Jan. 2013). 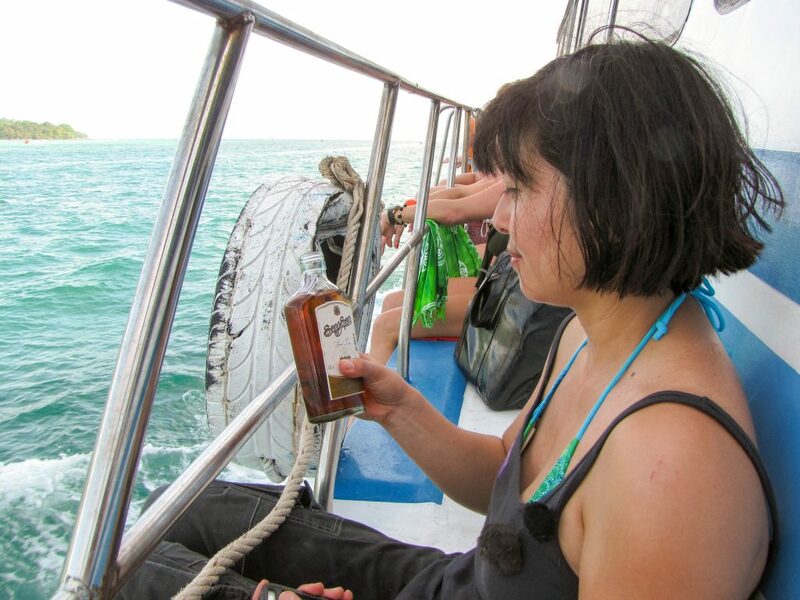 Shirley getting the local rum beta from the Czech climbers behind us (Jan. 2013). 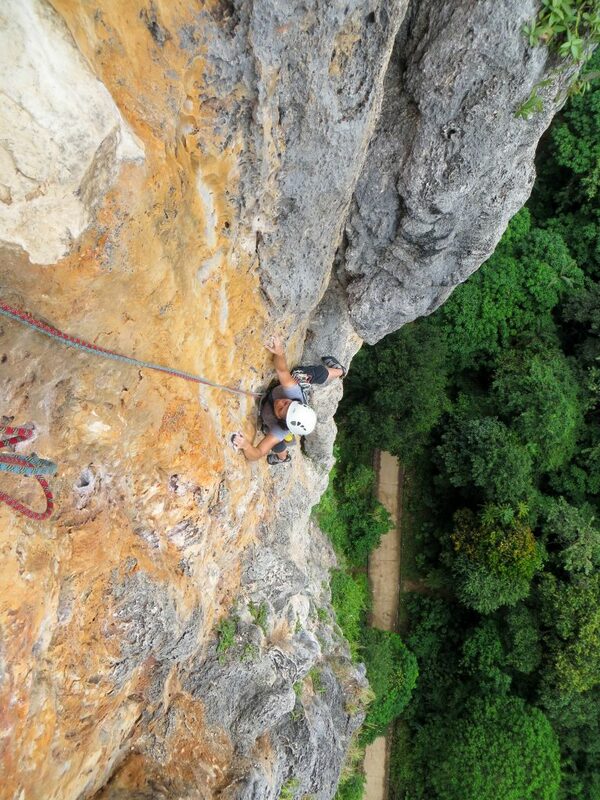 Pitch 4 topout (Jan. 2013). 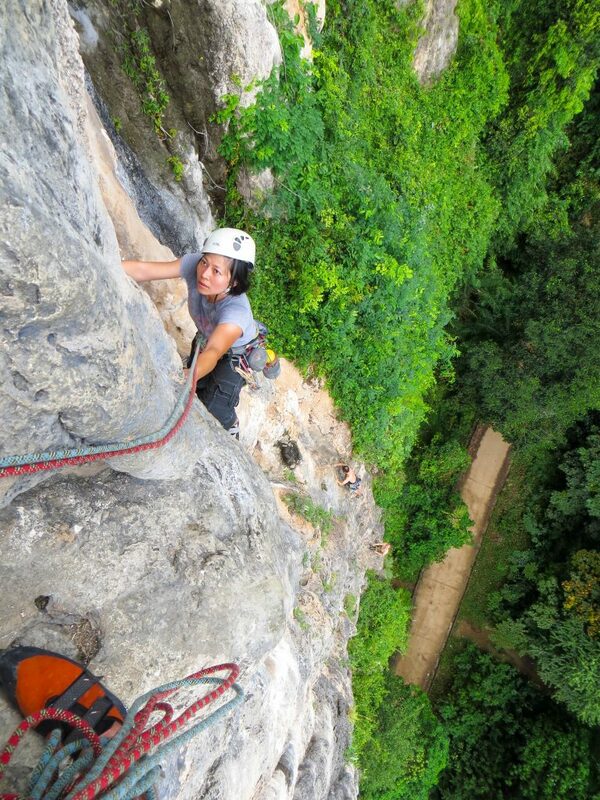 Shirley on pitch 5 (our final) of Pai Noon Mai on Ton Sai Tower (Jan. 2013). Nearing the top (Jan. 2013). 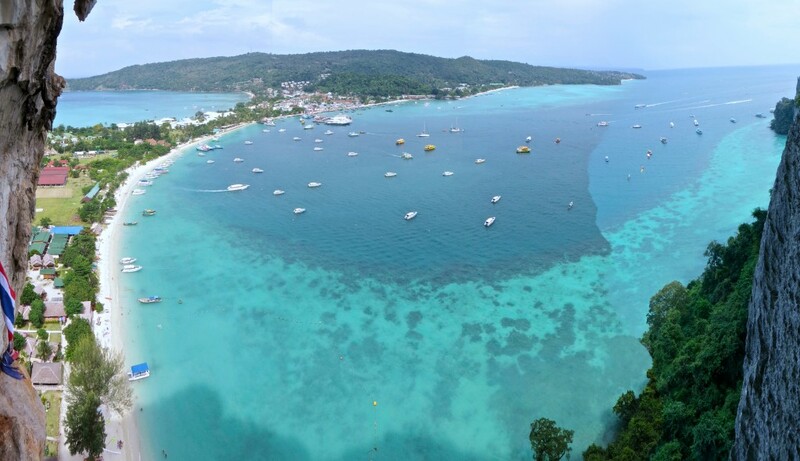 Looking towards the isthmus of the island of Phi Phi Don from high on Pai Noon Mai route (Jan. 2013). 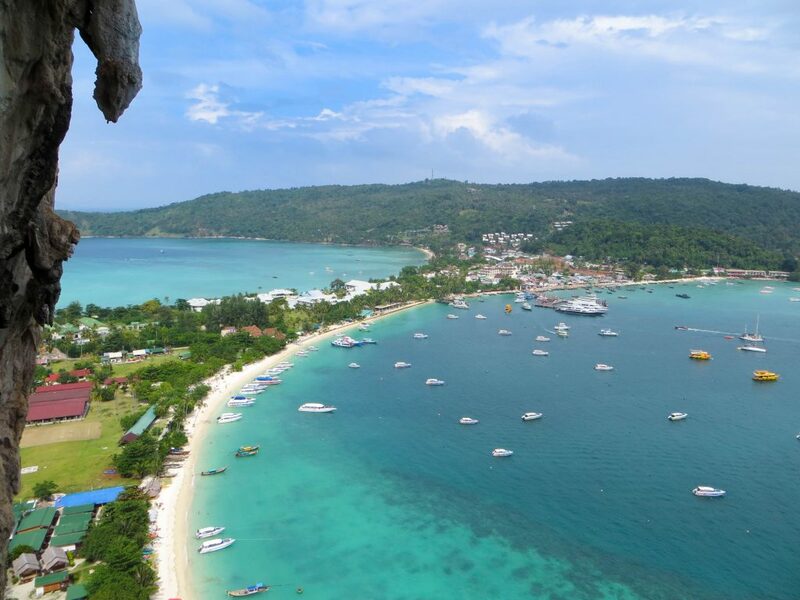 Phi Phi Don Island – views from high on the route. 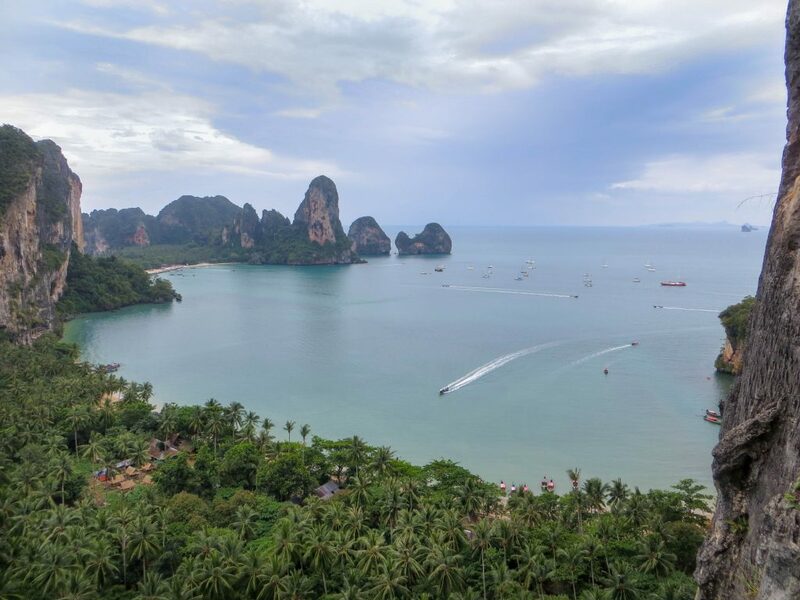 Enjoying some local rum on the ferry ride back to Railay from Phi Phi Don…the stuff was recommended by the Czech climbers we met on the climb (not bad esp. for the 150 Bhat price). 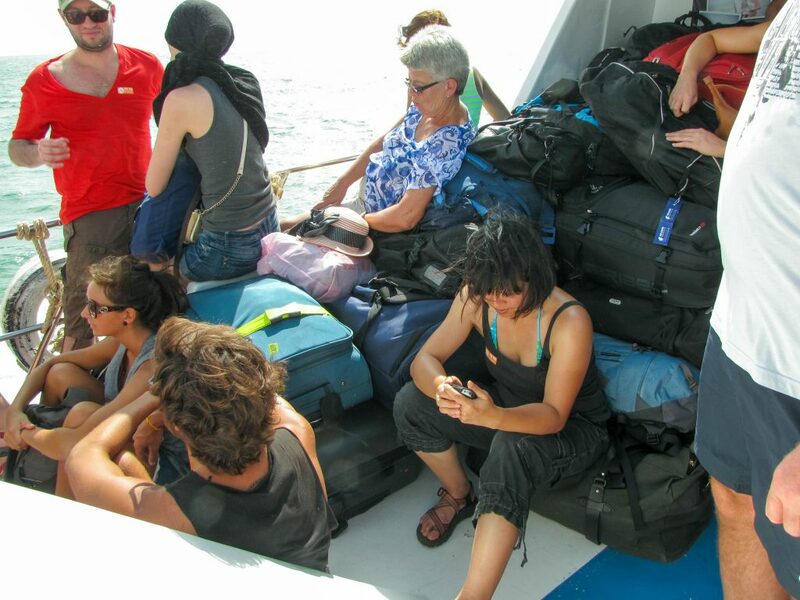 Shuttling back to Railay from the Phi Phi Don ferry (Jan. 2013). 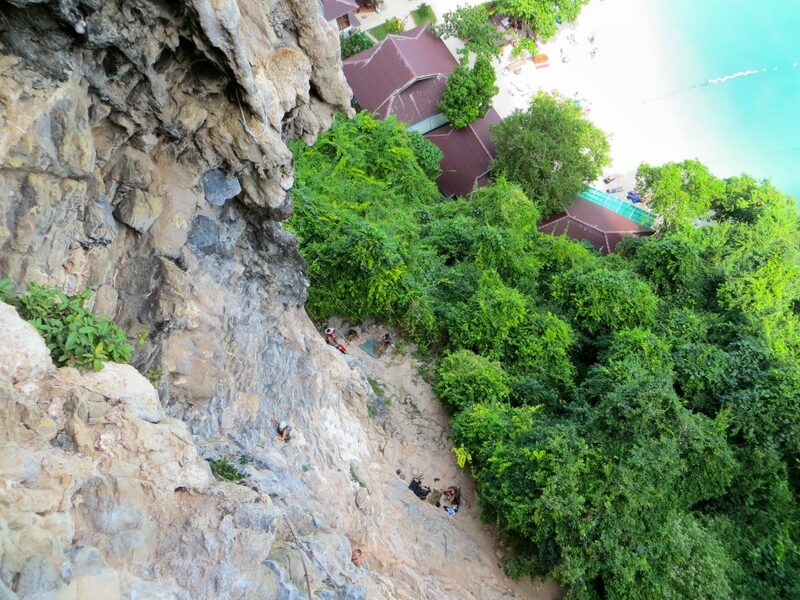 The incredible looking Thaiwand Wall with Railay West beach on the left. Think most routes that tickle the top of this thing (left side face visible in profile) are unfortunately out of our league (Jan. 2013). 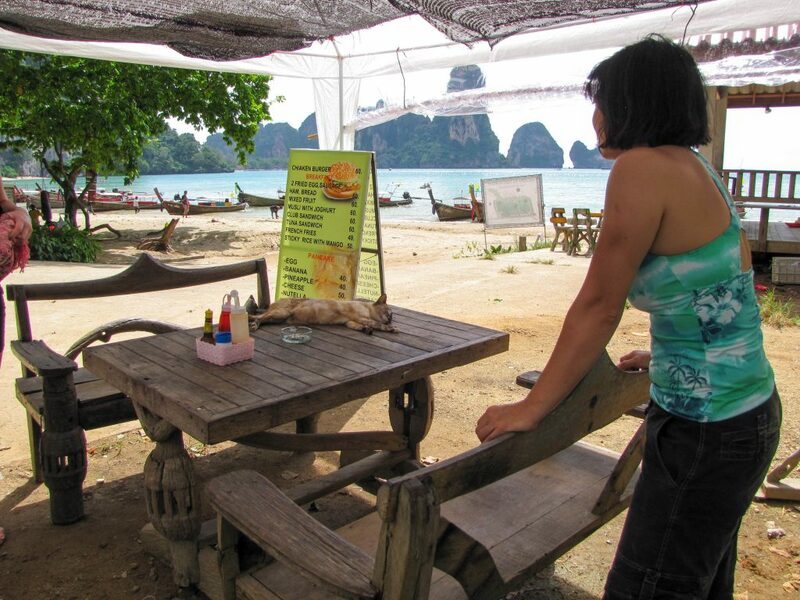 Although the vast majority of places served up top notch fare, the cat at this particular place was definitely underdone (Jan. 2013). A bit of light shopping in Railay…the place we stayed at was nice and folks working there were very helpful but occasionally would forget to restock TP (Jan. 2013). 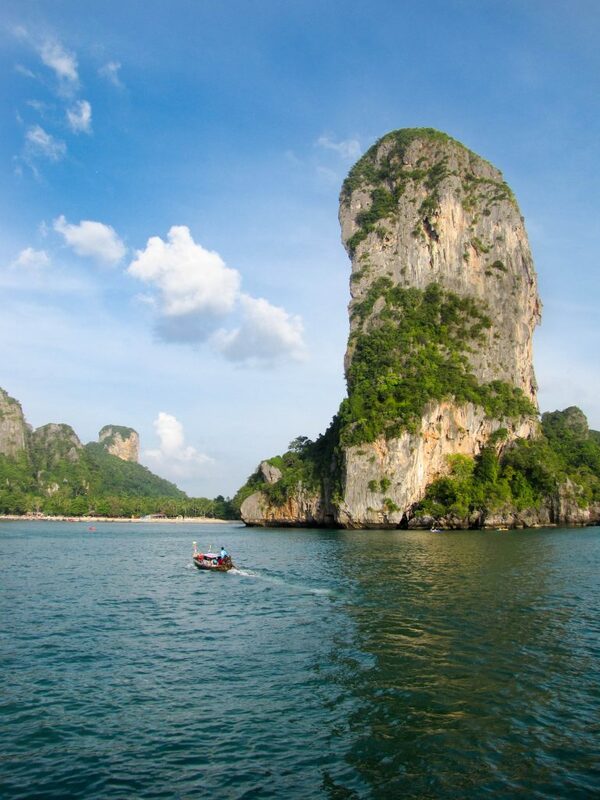 Go to Krabi Part 3.